Clean the mussels by removing the beards and scraping any dirt carefully with a small Knives. Make sure that you discard mussels that remain open. In a deep pot (one that has a lid), fry the chopped onion in the olive oil over a medium heat until they begin to soften. Slice the streaky bacon thinly and add to the onion. Fry until the bacon starts to brown. The garlic can be thinly sliced, or minced using a hand held crusher, and add to the pot and fry for a minute. Add the mussels, and stir it around the pot, then add the shot of brandy. Place the lid on the pot and turn the heat up to high and cook for 3 minutes. Give the pot a little shake each minute to help the mussels release their juices, and help them open. After 3 minutes all of the mussels should have opened, if not, close the lid and give it 1 more minute on a high heat. Turn the hob off and add the single cream to the pot and stir in the chopped parley. Serve immediately with some nice crusty bread. 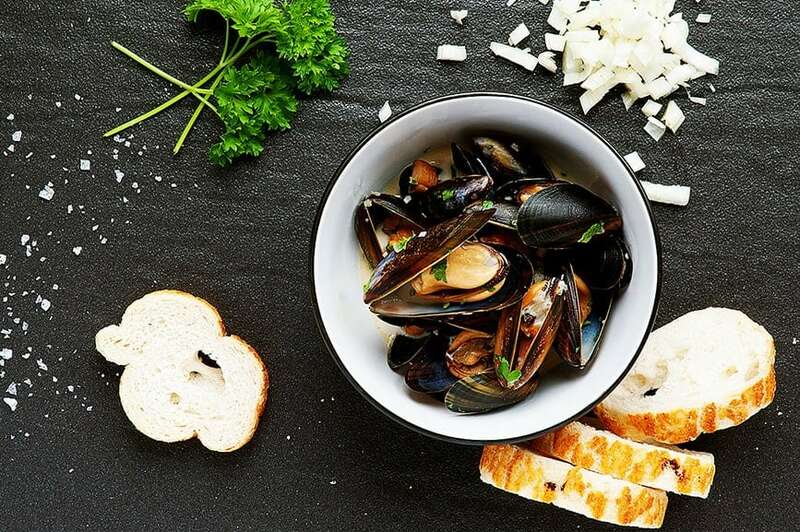 Discard any mussels that did not open during the cooking process. If you come across an open mussel when cleaning you can give it a tap with the side of your knife and it should close after a few minutes, or you can run it under cold water and it should close a few seconds. If the mussel shows no sign of life then you can discard the shell as it is not fit for eating. As you are using smoky bacon, and the mussels release salty juices there is no need to add any salt to this recipe. 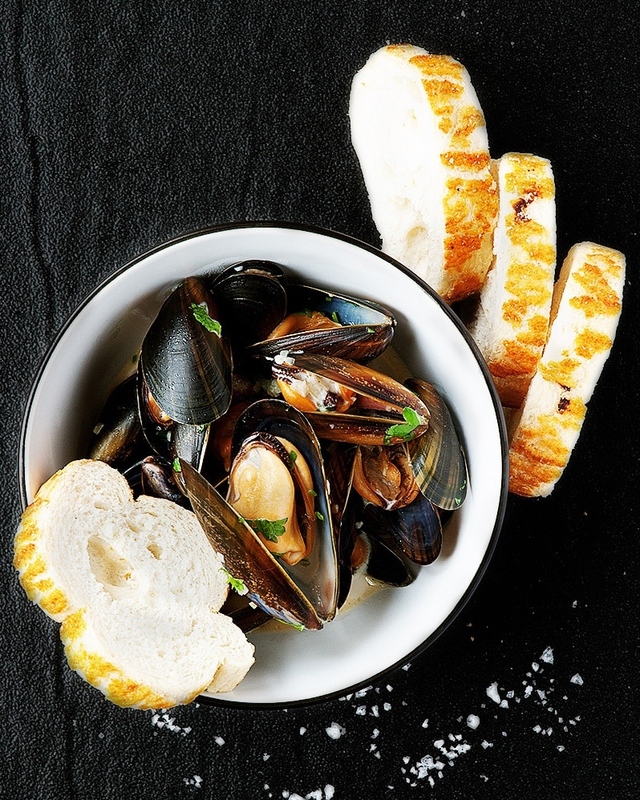 This is a recipe which I have to make every so often as my 3 year old son always asks for mussels when he sees them on the fish counter when we do the weekly shopping. I find it cutely odd that my son loves mussels so much considering he’s quite a fussy eater. So when he asks for them it’s hard for me to say “no”. Mussels have to be one of the most under rated meals out there as they are pretty cheap, quick and simple to prepare. I used to make them with a glass of white wine, and one day there was no wine in the cupboard. My wife suggested a shot of brandy so I gave it a go and the results were pretty good. After the fast boil with the lid on, and tub of single cream you wouldn’t know that the mussels were cooked in brandy, and creamy sauce has not been watered down too much as only a shots worth of liquid was used. Since this fortunate experiment, I have never cooked the mussels in wine since.